The March 21 meeting has been cancelled. The April covered-dish luncheon is still scheduled for the 18th. 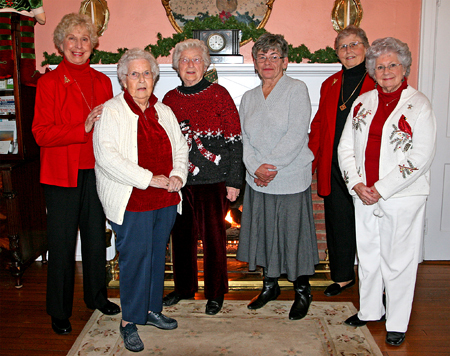 BEVERLEA WALZ PHOTO | Councilwoman Chris Lewis with SISCA’s 2012 officers, from the left, Gert Bourne, Charlotte Hannabury, Ginny Rowland, Emily Hallman and Ceil Kraus. Mollie Strugats and Joan Belaval were not present for the photo. The small dining room at the Ram’s Head Inn was the setting for SISCA’s Holiday Party Wednesday, December 14. Thirty-four members were on hand for the festivities; Town Councilperson Christine Lewis, who liaises with Island senior organizations, was there to swear in the SISCA officers for 2012, a yearly event in which, I’m sure, she delights. Raising their right hands for the ceremony were Emily Hallman, president; Gert Bourne, vice president; Ginny Rowland, treasurer; Charlotte Hannabury and Ceil Kraus, program co-chairs; and Mollie Strugats, trip coordinator. Former President Joan Belaval, who had agreed to return to the SISCA board as secretary, was unable to attend due to illness. Bennett Konesni, the director of the Sylvester Manor farm project and a superb musician, provided appropriate guitar music throughout the luncheon, and Linda Betjeman, the Presbyterian Church’s Minister of Music, played the piano for a brief sing-along. Emily Hallman has modest expectations for SISCA’s 2012 program next year. The next meeting, she said, is set for Wednesday, March 21 and will feature “Zingo,” a modified version of Bingo, and a “wrapped gift” auction. Sylvester Farms’ Mac Griswold is scheduled to speak later in the year. Although SISCA’s membership numbers are sadly diminished, it is still a viable organization, dating back to the early 1970s when Gray Panther Power gained momentum nationwide. It has served the Shelter Island senior community faithfully and well over the years. SISCA is the acronym for the Shelter Island Senior Citizens Association. 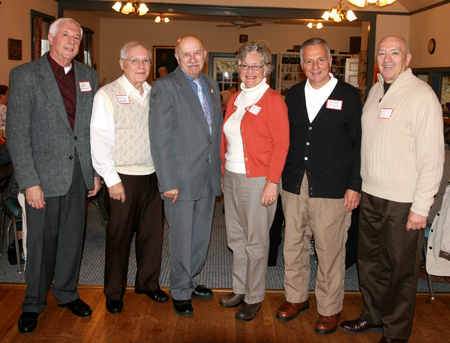 BEVERLEA WALZ PHOTO | SISCA members and special guests at September’s annual picnic. 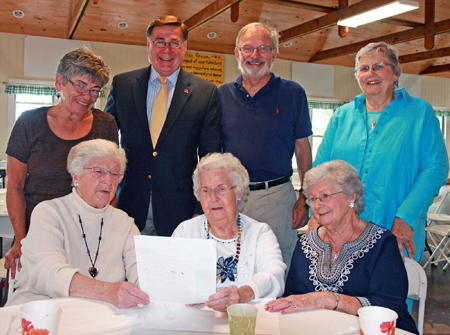 Standing, from the left: Treasurer Ginny Rowland, County Legislator Ed Romaine, Town Supervisor Jim Dougherty and SISCA President Emily Hallman; seated, Program Co-Chair Charlotte Hannabury, Vice President Gert Bourne and Program Co-Chair Ceil Kraus. All the planning and preparation paid off when 30 members and special guests County Legislator Ed Romaine and Town Supervisor Jim Dougherty gathered at Camp Quinipet for the Shelter Island Senior Citizens Association (SISCA) annual picnic on Thursday, September 22. The picnic’s centerpiece was, of course, the traditional fried chicken, a crisp and succulent dish prepared by Shelter Island’s Commander Cody’s on Smith Street. SISCA’s VP Gert Bourne did the ordering. Side dishes, donated by the members, were distinctive and unduplicated, thanks to program Co-Chair Charlotte Hannabury’s careful monitoring. There was Cuban bread from Millie Strugats, macaroni salad from Jeanne Woods and an unusual string bean, mushroom, olive and pepper salad from Martie Williams, to name only a few of the delights available at the dining hall’s food table. Angela Corbett and Shirley Ferrar, tried and true veterans of other SISCA events like the November Ecumenical breakfast, supervised the entire food service operation from their command post in the Quinipet kitchen. County Legislator Romaine, who never misses a SISCA event if his calendar permits, agreed that “the chicken is fantastic. My job is to watch out for Shelter Island, to ensure that the Island gets its fair share.” The SISCA audience, led by Supervisor Dougherty, acknowledged Ed’s commitment with a standing ovation. SISCA was organized in the early 1970s when the “Gray Panthers” moved front and center nationally. SISCA’s mission then and now was twofold — educational and social. The October meeting emphasizes the educational component of its mission. Looking ahead to the November elections, SISCA will co-sponsor a “Meet the Candidates” forum with the Women’s Community Club on Wednesday, October 5 in the Presbyterian Church’s Fellowship Hall. BEVERLEA WALZ PHOTO | SISCA auctioneer Jeanne Woods calls it like it is. Mollie Strugats was another big bidder. She took home a bottle of “Sweet Pea” cologne and, to her delight, a pen and pencil sketch of a bird, a grouse she thinks, ready for framing. Jeanne Woods has served as the SISCA auctioneer for at least 10 years. For my money, she is a professional caller whose “Going once, going twice … SOLD” reaches the rafters at Fellowship Hall. She could be Sotheby’s eastern Suffolk auctioneer if she ever had the time to audition for the job. “Zingo” is a variation on the ages-old game of Bingo. Robert Strugats, well known in certain select circles as the Dinner Bell’s jokemeister, called the numbers with his usual elan. His wife Mollie thought he was funny; Joan Belaval thought he was hilarious. And Bob Gundlach was just pleased to be able to turn the job over to Robert — from one World War II vet to another. The auction raised $49 according to President Emily Hallman. Zingo probably paid for itself, with players paying $5 a card. The big winner was Lorraine Hoppler, whom I could not reach at home Monday morning. Perhaps she had taken her $15 in winnings to the gaming tables at Atlantic City. Although there was regret among the SISCA leadership over the small numbers in attendance at the April meeting, there was general agreement that those who came got their money’s worth of fun and games.